Cook the spinach for about 5 minutes in boiling water and blend it to a fine paste after it has cooled. Cut the paneer into small cubes and fry in oil until light golden brown. Heat oil in a nonstick pan and add the cumin seeds. Wait until oil crackles and then add the chopped onions and green chilies. Sauté until the onions are golden brown, then add the ginger paste and garlic paste and sauté for another minute. 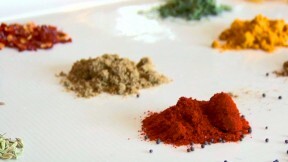 Add the turmeric powder and chili powder and sauté for another 1-2 minutes. Then add the tomatoes and stir until the oil separates. Add the spinach paste to this mixture along with 1 cup of water. You can use the same water you used to cook the spinach. Add the paneer, garam masala, sugar, and salt, and cook until the gravy bubbles. If the gravy seems dry, you can add a little bit more water.